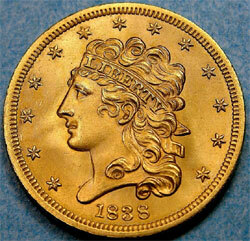 The Classic Head Half Eagle was first struck with a composition of .8992 gold and .1008 silver and copper. In 1837, this would be altered to .9000 gold and .1000 copper, with silver left out of the denomination for the first time. While there is a slight difference in weight for the two compositions, the weight of 8.36 grams (129 grains) is generally accepted as the standard weight for all issues. The standard diameter for all pieces is 22.5 mm, a reduction from the diameter of 25 mm which had been used for all previous half eagles. All coins are struck with a reeded edge. Coins of this type struck at the Philadelphia Mint do not carry a mint mark. Those struck in Charlotte and Dahlonega carry the “C” or “D” mint mark on the obverse, directly between the bottom of the truncation of the neck and the date. Usually it is located directly above the space between the 8 and 3 numerals. Striking quality varies, especially for the two Branch Mint issues, although fully struck pieces are extremely rare for all dates. Most will exhibit at least some weakness in the details of Liberty’s hair. Further problems are extensive and deep marks in the fields, a problem with all gold coins but especially with this type, and lack of overall eye appeal. Because of this, gems of this type are extraordinary rare.